This card combos well in any anarch deck that's running either Inject, Retrieval Run or Street Peddler. With Inject, first you use Making an Entrance so that you can fix what cards you'll draw. Low on cards and want to fill up your hand? Place anything but programs in the first floor slots. Want some credits? Do the opposite and top load your stack with programs. Similarly with Street Peddler, nobody likes it when they get two or even worse three cards that they'd have really liked hosted on Street Peddler knowing that you're going to lose two of them. 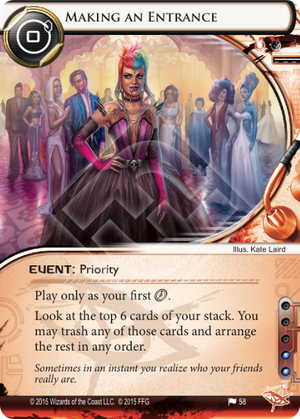 So before putting it down you rearrange the top six cards of your stack so that you can be sure to know what's going onto Street Peddler and whats going to end up in the head. With Retrieval Run. You can put programs that you want access to right away but don't want to pay the install cost of them simply by trashing them straight to the bin. Things like Femme Fatale. And of course if you're splashing Clone Chip you can get programs into the heap that you want for your runs, something Anarchs are a big fan of. Making an Entrance can set you up with information for your next few turns or set up a combo to be used right away with the cards mentioned above. It can also trim the fat from your deck that you might not need in the current match you're playing. A good include in any Anarch deck. MaE is indeed a combo card more than a filter, because it can send cards to the heap and anarch loves cards in the heap. Use MaE, fix your next 4 draws while throwing Clot and Femme Fatal into your heap, then Retrieval Run to essentially play femme for 3 credits and getting it several turns sooner than you normally would because you got to dig 6 deep for it. MaE is ok as a cantrip if used solely for that, but it is a fantastic graveyard-shenanigans-enabler. If more ways come for players to cheat stuff into play from their yard, MaE will become a high-priority card in those decks. Remember MtG thinks digging 4 deep into their deck is hugely powerful and that's with 1/3 larger decks. MaE is just a piece to a combo we haven't seen yet.